Gandhinagar is the second planned in India next to Chandigarh.The city is located on the Sabarmati river and it is one of the commercial and administrative centres of Gujarat. This area is very rich in black soil and thus results in good cultivation.Gandhinagar is supposed to be the only place which was designed and planned by Indian Town Planners. The city is designed in such a way that it has 30 sectors where each sector has its own shopping and community center, primary school, and health center. This place is full of rich history and culture and mainly because of Mahatma Gandhi who lived here. Gandhinagar which is also located in the Deccan Plateau is geographically washed by the waters of the Sabarmati River. The north east of Gandhinagar is flanked by Ahmedabad. This capital city of Gujarat got its name from the Father of the Nation, Mahatma Gandhi. Though Gandhinagar was established in 1960, the city got its identity only after Mumbai was split into two different states namely Gujarat and Maharashtra and it was then Gandhinagar became the capital of Gujarat. Roopal village is also known for the 'Palli'festival which is celebrated along with Navaratri. This festival falls in the month of mid January. Though it is celebrated throughout India here in Gandhinagar it is celebrated with great enthusiasm by flying of colourful kites. This festival is more of a community event in Gandhinagar during which the people celebrate by singing devotional songs and dances. This falls in the month of September or October. 1. 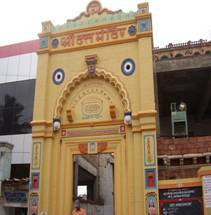 The Hanuman temple in Gandhinagar is one of the major tourist attractions for Hanuman is believed to be a very powerful God. The idol here in this temple is the statue of Hanuman with a mountain on his shoulder. The temple is visited by lot of devotees and tourists on Tuesdays and Saturdays. This temple is located in the centre of the city at a very convenient place which can be accessed by any mode of transport. 2. 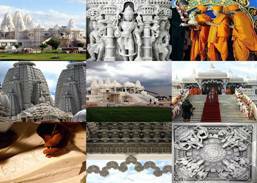 The Swaminarayan Temple is a very famous one not only in Gujarat but also all over India. It is a place which should be visited without missing by the tourists coming here. The deity here is Lord Swaminarayan which is fully plated with gold leaf. Along with this there are also idols of the followers of Lord Swaminarayan which is fully made of marble. This temple is just 2kms away from the heart of the city. The temple is known for its architecture which is designed with 100 beautifully sculptured pillars, balconies, podium and seventeen domes. Capital Complex is a very famous and equal to a historically important monument. This Capital Complex located in the Sector 10 of Gandhinagar is a blend of modernized building with fine architecture. This complex is occupied by the legislative offices of Gujarat. The Vithalbhai Patel Bhavan which is occupied by the Vidhan Sabha and the legislature office has a dome erected on a podium. The Vithalbhai Patel Bhavan is flanked by two magnificent buildings namely Sardar Bhavan and the Narmada Bhavan and they are connected by hanging corridors. The State Secretariat is located in the Sardar Bhavan and offices of the Department Heads in the Narmada Bhawan. This is also one among the best monument located in Gandhinagar.It is fully constructed with pink sand stones. This cultural complex has 7 feet gold leafed idol of Lord Swaminarayan. 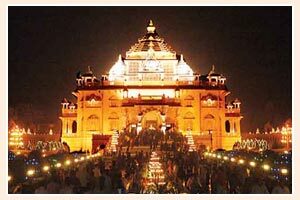 Akshardham is a place of education, entertainment and enlightenment. Hundreds of figures, dioramas, displays and audio-visual shows, unfold a stream of timeless experiences. They are visually mesmeric, scientifically stunning, and spiritually moving. 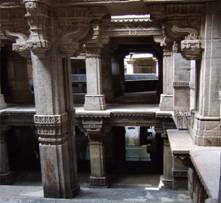 This is a four level well built during the reign of Queen Rudabai and is located at a distance of about 18 kms north of Ahmedabad.The well used to quench the thirst of the travellers passing by and also helps people in relaxing. But however now it remains as dry. This place is located in Ahmedabad which aims to provide a perfect blend of education and entertainment. It will showcase contemporary and imaginative exhibits, minds on experiences, working models, virtual reality, activity corners, labs and live demonstrations to provide an understanding of science and technology to the common man. 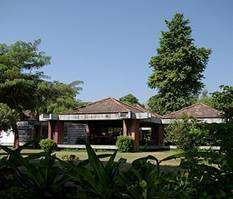 Sabarmati Ashram which is a colony popularly known as Satyagraha Ashram or Harijan Ashram during Gandhiji's period. It is the second home of the father of nation from where he started to fight for the countries freedom. In this ashram Gandhi's cottage,"Hriday Kunj"is still very well maintained preserving all his valuables like round eye glasses, wooden sleepers, his personal letters, books and spinning wheel etc. There is also a small museum," Gandhi Smarak Sangrahalay" which has things lot to talk about Gandhiji.It is from this ashram the most famous and the historic dandi march started. Ahmedabad is known for its multiplexes and for starting the multiplex's market race in India. The first ever multiplex in India, CityPulse, is situated in Gandhinagar. A number of multiplexes, Fun republic, City Pulse, R World, Wide Angle to name a few, are situated both in and near Gandhinagar and on Ahmedabad Gandhinagar highway. This park is situated in the Sector 28 which is a major attraction for children. This park has fun rides and boating facilities. This is a picnic spot located in the sector 9 along the river front. It is a fully recreational area. This place is very close to Sarita Udyan attracting children and tourists having different species of deers. This village is located near Gandhinagar, on the Sabarmati river back, is Pethapur village, about 7kms from Delhi. It is very much known for its `Bandhani' saris and the wooden printing blocks produced here were also exported to different countries. The Pethapur craftsmen are mainly Gujjar Suthars. The main shopping items which is of tourists attraction in Gandhinagar includes Wall hangings, Embroidered footwear, Patola Silk sarees, Bandhnis,traditional Gagra-Cholis, Lacquer furniture, Marriage costumes, Embroidered, appliquéd quilts, Cradle clothes, Curios and Cloth toys.People coming here never leave the city without buying Khadi clothes. Most of the training passing the western part of the country runs througgh Gandhinagar. Gandhinagar is well connected to the metropolitans of the western India. Most of the train going to Mumbai passes through Gandhinagar. Gandhinagar is not provided with an airport but however it can be reached from the nearest airport in Ahmadabad.Domestic Airlines like the Jet Airways, Air Sahara, Indian Airlines and Spice Jet operates regular flights to Ahmadabad from other parts of the country. Gandhinagar is very well connected by road from the rest of the state. There are regular government and private bus services that connects Gandhinagar to the neighboring cities.